The last time we saw an entry in the Sacred RPG franchise was in 2009. The developer, Ascaron, had dropped every penny it had into developing the game. Development went on for so long, in fact, that the company was forced to dissolve as it couldn’t pay down debts incurred during that time. Deep Silver (of Dead Island fame) picked up the license for the franchise, and that same year intentions for a sequel were made known, with Keen Games as the developer. Fast forward half a decade, and Sacred 3 has finally been unleashed upon us mortals. Is this the Sacred fans have come to know, or some other beast entirely? Sacred 2 was open-world. Sacred 3 is not. Sacred 2 had seven playable characters. 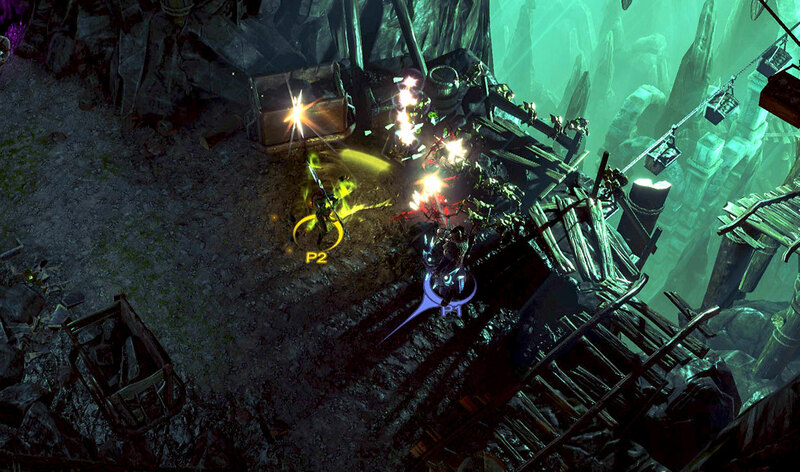 Sacred 3 has five, only four of which are available from the outset. Some core features of the previous game have been changed, and not all of them are for the better. Gone are side quests that you discover from roaming the countryside, replaced by side missions that you simply click on a map. Trading and purchasing weapons from a merchant is now done in the lobby system, removed from the game world entirely. Drop-in/drop-out co-op is always appreciated, and two players on the same console is sadly a rare treat that is graciously included in Sacred 3. Now, Sacred 3 was created under a different team entirely than Sacred 2, but to move so far from the original almost makes it feel as though the game shouldn’t have the number 3 in its title, but a subtitle, or something else entirely. Gameplay is pretty simple. You use face buttons for various moves, L1/R1 for more powerful moves depending on which skills you have equipped, L2 for an execution when prompted on a fallen but not yet killed enemy, and R2 to perform a summon that helps your party. There can be some strategy as to when you use your more powerful moves, but for the most part you will simply be mashing X and square to get through wave after wave of enemies. Even boss characters require little more thought than pressing circle to escape a knockdown move, then hit the boss while they’re recovering or charging up an attack. 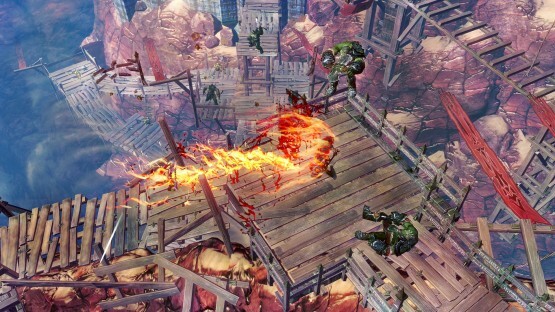 The combat sits somewhere between monotonous and average, but then again this is a hack-n-slash. While you level up your character, you also unlock bonus abilities for each weapon that you pick up as you use them. While the weapons themselves do not level up, you can purchase new abilities using in-game experience you have earned while on a mission. Along the way, you will pick up “weapon spirits,” which are these sarcastic NPCs that apparently grant you abilities because you have freed them from the weapons they were trapped in. These are essentially buffs, and can be combined if you are playing multiplayer. Other than the personalities of each spirit, there isn’t much you haven’t seen before here. There’s audio work here, in the form of a typical action-oriented soundtrack, as well as full voice-overs for all characters. While this effort is much appreciated, it’s a shame the script in Sacred 3 is so terrible. There are jokes-a-plenty here, but most of them fall so flat as to be horizontal. Perhaps the type of cheesy, predictable humor used in Sacred 3 appeals to a certain type of gamer. All I know is that for me, hardly any of the jokes resonated, and those that did I felt I had heard before. It felt like the developer was trying to get you to laugh at them a bit too hard. Sacred 3 is by no means a bad game. It’s just not a particularly great game, either. With a linear storyline, no traditional Overworld, and repetitive combat that is too easy to master, there is not much of a challenge to be found here. This is the kind of game you play if you are a huge fan of the genre, because it will definitely satiate the hack ‘n’ slash desire. Ultimately, it feels like something is missing from Sacred 3 to help it rise above average status, and its $50 asking price is not helping. Drop-in/drop-out co-op is easy and simply works. Combat is easy to handle. Progress carries over from multiplayer. Attempts at humor seem forced. Plays like any other isometric RPG.